The concept of culture in autism research is…useful not just for characterizing a community’s system of meanings that influence how autism is identified, managed, experienced, etc., but for showing that those meanings are constructed and can therefore be changed. In an earlier volume on autism, published in Ethos, Nancy Bagatell (2010) describes the recent emergence of autistic communities and autistic identities as both a rejection of biomedical and deficit model, and as a new form of sociality made possible by historical conditions. In Silicon Valley, for example, autism is increasingly less stigmatized and more valued as employers begin to associate autism with the cognitive skills necessary for innovation in high technology. Bagatell (2010: 51) writes, “It is evident that as society is transformed by technology, the nature of human sociality may be scaffolded and transformed in ways that come to mirror an autistic sociality and thus reframe the disabling properties of autism itself in more positive terms.” … Cultural practices thus can shape the experience of autism, and autism can in turn shape cultural practices. …All of these authors focus on what people with autism can do, rather than what they cannot do, or what might have been; and they equally focus on what societies can do to change the lives of people with autism. At the end of 2012, after intensive lobbying by parent activist associations, a federal law recognized autism as a “disability for all legal purposes” in Brazil. Defining autism as a disability was more than a change of legal status to guarantee social benefits. It was also a political maneuver, orchestrated by parent associations, aimed to take the responsibility for treatment away from the public mental health network of services. This article examines the controversies that have set parent associations in direct antagonism with mental health professionals in the public health system. We draw from ethnographic data and theoretical discussions in the field of disability studies to situate these controversies within the context of a larger debate on the relationship between health, rights, and citizenship. We found similarities between the ethical and political goals of parent activists and mental health professionals in Brazil, but we argue that the main cause of dissent is the role that each of these social actors assigns to identity politics in their clinical and political projects. Many therapies, interventions, and programs seek to improve outcomes and quality of life for people diagnosed with autism spectrum conditions. This paper addresses Italian professionals’ perspectives on a variety of such interventions, including TEACCH, ABA, Defeat Autism Now!, and Doman–Delacato. Drawing on participant-observation and interviews collected in 2012–2013 in a northern region of Italy, it highlights the theme of “rigidity” that appears in professionals’ discourses about both the characteristics of people with autism and the potential risks of adhering too strictly to any particular treatment protocol. The co-occurrence of the theme of rigidity across different domains demonstrates a way in which diagnostic characteristics become metaphors for medical practice. This paper proposes that such discursive moves may help bridge the gap between people with autism and people who work with them because a key attribute of people with autism—thinking and/or acting rigidly—is also a potential pitfall for people without autism. The home is a critical place to learn about cultural values of childhood disability, including autism and intellectual disabilities. The current article describes how the introduction of autism into a home and the availability of intervention options change the structure and meaning of a home and reflect parental acceptance of a child’s autistic traits. Using ethnographic data from Kerala, India and Atlanta, GA USA, a description of two types of homes are developed: the custodial home, which is primarily focused on caring for basic needs, and the therapeutic home, which is focused on changing a child’s autistic traits. The type of home environment is respondent to cultural practices of child rearing in the home and influences daily activities, management, and care in the home. Further, these homes differ in parental acceptance of their autistic children’s disabilities, which is critical to understand when engaging in international work related to autism and intellectual disability. It is proposed that parental acceptance can be fostered through the use of neurodiverse notions that encourage autism acceptance. Every summer, a group of role-playing gamers gathers in an American town. Dressed up as moon goddesses, mad scientists, and other fantastical characters, they act out elaborate, improvised narratives of transformation, destruction, and redemption. For several summers, this group, who I call the Journeyfolk, ran a camp for teenagers on the autism spectrum, engaging campers in therapeutic reconfigurations of self and social role. Through this folk healing practice, the meaning of autism was itself transformed; what had been a source of isolation became a source of commonality and community. This paper takes the camp as a case study for examining the co-productive relationship between culture and neurodiversity. Cognitive tendencies often found in autism are often thought to preclude socio-cultural participation. However, such tendencies can also facilitate the co-creation of innovative cultural spaces, through processes of affinity and affiliation. Drawing on ethnographic fieldwork at the camp, I identify three sites of congruity between the culture of the camp and the cognitive and phenomenological experiences associated with autism, at which this “work of culture” (Obeysekere in The Work of Culture: Symbolic Transformation in Psychoanalysis and Anthropology, University of Chicago Press, Chicago, 1990) took place: the structure of social interactions within roleplaying games, the narratives enacted within these games, and the interpersonal relationships within which the games were embedded. ‘Being autistic’ or ‘having Autism Spectrum Disorder’ implies a limited range of ‘being social,’ but the in situ organization of interaction, what Maynard and Marlaire (Qual Soc 15(2):177–202, 1992) call the ‘interactional substrate,’ within which this delimitation enfolds is usually hidden from sight. Analysis of processes constituting different ‘interactional substrates’ provides a view of how one comes to be known by and to self and others as a certain kind of being who is available (or not) for acting and feeling in certain ways. People diagnosed with Autism Spectrum Disorder (American Psychiatric Association, Diagnostic and statistical manual of mental disorders, 2013) are often described as ‘being’ impaired in intersubjective understanding of others. But the story of ASD as an impairment of sociality and intersubjectivity becomes more complicated when animals enter into the picture. I consider two interactional substrates: a psychological interview in a mental health clinic, and an animal-assisted activity in a child’s neighborhood. I aim to elucidate the practical problems of ‘being social’ encountered by two children with ASD, both nine-year-old girls, within these two very differently organized interactional substrates. I consider ways in which ‘being with’ therapy animals provides a way of ‘being social’ through “sensory modalities of knowing” (Haraway, When species meet, 2008:371). Seaman A. Conceptualizing Autism Around the Globe — A special issue of Culture, Medicine and Psychiatry. Somatosphere. 2015. 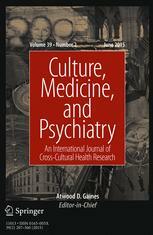 Available at: http://somatosphere.net/2015/conceptualizing-autism-around-the-globe-a-special-issue-of-culture-medicine-and-psychiatry.html/. Accessed April 20, 2019. Seaman, Aaron. 2015. Conceptualizing Autism Around the Globe — A special issue of Culture, Medicine and Psychiatry. Somatosphere. http://somatosphere.net/2015/conceptualizing-autism-around-the-globe-a-special-issue-of-culture-medicine-and-psychiatry.html/ (accessed April 20, 2019).